Emily Branch Designs | Branch Out. : Two Great Manufacturers! Get ready for a week of great projects and designs as Helmar and Best Creation come together to showcase both their products! 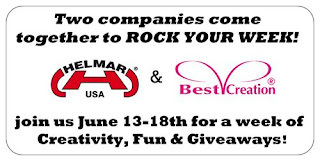 Both teams will be creating just for you, so make sure you stop by Helmar's Blog and Best Creation's Blog for inspiration and your chance to win some fabulous prizes!